Suffering from Bunion Pain ? A bunion is a deformity of the joint connecting the big toe to the foot and is known as a hallux abducto valgus among medical professionals. It is characterized by medial deviation of the first metatarsal bone and lateral deviation of the hallux (big toe), often erroneously described as an enlargement of bone or tissue around the joint at the bottom of the big toe (known as the metatarsophalangeal joint). Hallux Valgus can be extremely painful. The sensitive skin is very vulnerable to pressure and friction from shoes. 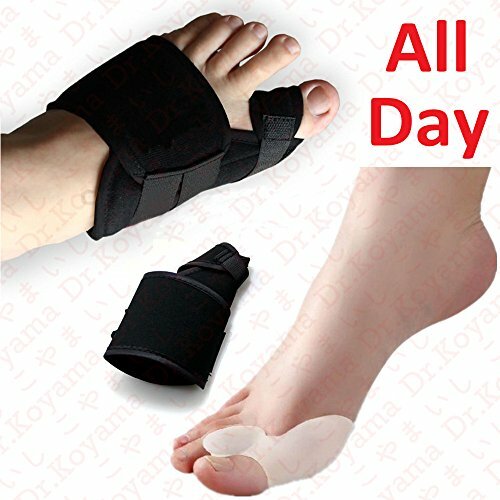 Dr Koyama designed a variety of orthotics splints or regulators include various footwear like gelled toe spacers, bunion / toes separators, bunion regulators, bunion splints and bunion cushions.which will reduce that friction so you won't have to feel that pain anymore! 1) Use the Nighttime Bunion Stitched Velcro Bunion Correctors Splint while you sleep to stretch tight tendons and toe muscles.It is made of Stitched Velcro and Flexible Polyester Fiber, protecting your foot muscle and sclerosis tissues of the foot bone. The Black Splint is a resting splint, only for static use (e.g. sleeping). Wear without a shoe. Not suitable for walking. 2) Use the Daytime Gel Bunion Sleeve to treat bothersome bunions. It provides superior bunion cushioning and relief. The sleeve will not slip out of place as you go about you day. The ultra-thin design can be worn under your sock to provide all day support and padding. INSTANT PAIN RELIEF - Fast and effective relief from Sports Injury, Bunions, Corns, Arthritis, Calluses, Hammer Toe, Hallux Rigidus, gout, etc. Total 2 Kinds of Bunion Correctors, Manufactured with a soothing gel that provides a faster relief. COMFORTABLE PADDING & ADJUSTABLE REALIGNMENT: The Ergonomic Toe Wrap & Bendable Toe Stabilizer bar provide adjustable realignment to help keep your big toe straight and relieve your night pain. Use the Ergonomic Toe Wrap to to get the perfect fit around your big toe. Use the Bendable Toe Stabilizer to conform the brace to the contour of your big toe for greater comfort. You can also bend the Stabilizer to provide more inward torque to straighten your big toe. Gel Toe Separator: Gel Toe Separator prevents the injured toe from rubbing against other toes and your footwear. If you have any questions about this product by Dr.Koyama, contact us by completing and submitting the form below. If you are looking for a specif part number, please include it with your message.